There is something about small games. Not those where the size of the game is an excuse for simply having no real decisions to take, but those which cram so much into a tiny box that the mind marvels at the thought process that came up with the idea. As I’ve stated before, one of the hottest trend right now is the micro game explosion. There’s a bunch of very cool games out already (Love Letter, Council of Verona, etc), coming out soon (Sail to India, Cheaty Mages, Coin Age) or on Kickstarter looking for funding (Burgoo, Tiny Epic Kingdom, and yes, I’ve backed both) and I’m quite sure that there are many more to come. All they have in common is a very small component list and some big ideas. However, being part of a trend doesn’t guarantee quality. Does Coup live up to the merits of the trend or does it fall short? Coup (Indie Board and Card Games) by Rikki Tahta is a 2 to 6 player game where you play as the mysterious powers behind the throne of the ruling elite. 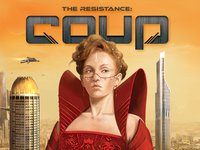 Set in the same universe as The Resistance, Coup will see the players bluffing as they attempt to remove the influence of the other players in order to be the last player standing. The aim of the game is to knock out the other players by removing their influence over the ruling elite, represented by two face down cards, representing various characters. By using various actions, the players will be forced to reveal their face down cards, losing their influence over these characters. The winner is the player who manages to keep at least 1 card while the other players have none. While there might not be much in the box (it is after all, a micro game), what is there is of superb quality: there are 15 cards (3 each of 5 different roles: the Contessa, the Ambassador, the Captain, the Assassin and the Duke), 50 cardboard coins, 6 player aid cards and a slim rulebook. The art on the cards is very nice and the cards themselves have a linen finish. While they may not be plastic cards, they should last a good long time. The rulebook is clearly written and easy to reference during the game, should there be some questions. Setting up the game is super simple: shuffle the 15 cards, deal two to each player along with two coins. The remaining cards and coins are placed in the middle of the table, within reach of every player. Select a starting player and you’re ready to go. On their turn, a player will chose to do one action, either a base action (no specific character needed) or a character action. Now, you don’t actually need to have the character since you will not need to prove that you have it, unless someone challenges you (more on that later). Some of the actions can also be blocked by other players, again if they claim to have the character that can block that action. They don’t have to prove they have the character, unless challenged. Coup: Pay 7 coins and remove 1 Influence from a player. Cannot be blocked. Tax: This is the Duke’s action and it allows the player claiming to have him to take 3 coins. Cannot be blocked. Assassinate: By paying 3 coins, the player claiming to have the Assassin can remove 1 Influence from any player. Can be countered by the Contessa. Steal: If a player claims to have the Captain, they can steal 2 coins from another player. This can be blocked by either another Captain or by the Ambassador. You’ll note that the Contessa is a purely blocking character since she doesn’t have any actions per se. If a player isn’t challenged when they do an action, they simply complete their action and the next player does an action. Should they be challenged (either because of the action or when attempting to block), they will have to show the character on one of their face down card. If they had the character, they put the card back on the remaining cards, shuffle and draw a new card. The challenger must flip face up one of their face down card, losing an Influence, possibly knocking them out of the game. If the challenger was right and the player did not have the character they claimed to have, that player must flip one of their face down card, losing an Influence. Again, should this be their last face down card, they are out of the game. The same rule applies to a player blocking another player’s action, with the action being cancelled if either the blocker wasn’t challenged or proved that they had the right character if they were challenged. One last little rule: a player can never have more than 10 coins. Should they have 10 coins at the start of a turn, they must do a Coup against one player. Last player with Influence (face down card) wins. I really really like Coup and it might actually be my favorite micro game so far. The high level of interaction of the game along with the fact that it can be a quick game (once the players know the rules) make for some really fun situation. One aspect I find especially interesting is the quick shifts in moods, in pacing. The first few turns will usually find people being safe, taking one coin, maybe two and no challenges being done. There might be one or two players claiming to have a specific character, but for the most part things are quiet. Once the game goes around once or twice, people start to remember what was called by a player and doubts start to creep in. “Wait, you said you had the Captain and the Duke. Now you say the Ambassador?”… slowly, one person will challenge and then that’s when the fun really starts. Paranoia breaks in, people start second and third guessing themselves, sentences become “…and thus you want me to think that you think that I think…”. Loads of fun. Players can always try to calculate the odds: it’s not that hard since there are only 5 roles, each player getting two cards and each card being present in the deck 3 times. What throws a little chaos in is the Ambassador, which allows the player to see more cards, but also change what he has. And that’s also the problem with challenging someone: you might lose an influence, but even worse, the other player will switch his card. If you play with 6 players, there are only 3 cards in the middle of the table, meaning that the player who swapped his card has a 25% chance of getting said card back (remember, you put the card back, shuffle and then get a new card). Maddening, but in a good way. The game is fairly simple to teach, but it’s perhaps easier to go over the rules very quickly and then play. Most players will understand after one round and, if they are quick on the draw, a game should only last about 15-20 minutes, which should be plenty fast to then play another game right after. Perfect either as the appetizer at the start of the evening or really funny as the last game of the evening when people are really tired and tend to make mistakes, this is a game for all level of players. Do yourself a favor and pick up a copy now. Very highly recommended. This entry was posted in Review and tagged Coup on January 11, 2014 by TopDog.